SKODA is a Czech automobile manufacturer founded in 1815 as Laurin & Klement, also well known as one of the world's oldest car manufacturers, celebrating over 120 years of production. While upgrading their corporate visual identity and launching a newly designed SUV car SKODA also aimed to create a new internal “brand tool,” specifically developed for the Chinese market. It would realign and re-articulate 120 years of knowledge and expertise, enabling employees to have access to the brand’s entire library of assets, from brand history to brand vision and promise to help better target consumers and craft retail selling strategies. Rather than using previous internal interactive tools to communicate, we introduced the idea to develop the new platform under the form of an app to optimise its access no matter where employees are. 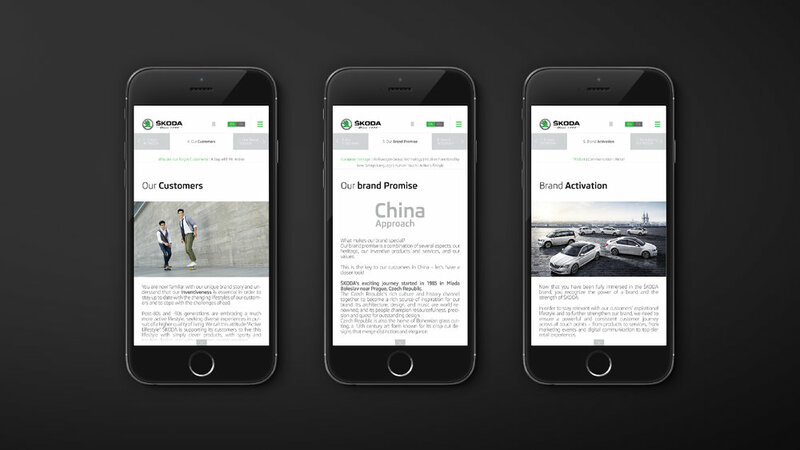 Following the new CI being built along side, and facing the challenge of a considerable amount of content, I aimed to design an intuitive and easy-to-navigate mobile experience. The overall journey is based on a rotating carousel of content, where users can easily tap left and right to the following chapters from the menu tabs above, or by scrolling to the end of each section, which seamlessly leads to another chapter of content.